Side view of the Leesa adjustable base in a flat position. Side view of the Leesa adjustable base in a zero gravity position. We founded Leesa with the simple goal of helping people sleep better. We’ve started with a beautifully designed and crafted mattress, and an online store that makes buying a mattress simple and hassle free. The Leesa is a luxury mattress that has an iconic timeless look, uses the highest grade, American-made materials available, and comes in at a fraction of the price of most Tempur-Pedic or luxury innerspring mattresses (Queen size retails for $890). The 10" Leesa has a plush polyester-lycra cover that is soft and cool to the touch, with an iconic look resembling an old Pendelton blanket. It utilizes three layers of foam to provide that "just right" feel, sink and bounce. A 2" perforated Avena foam top layer keeps you cool, a 2" middle layer of memory foam gives you the body contouring and pressure relief you've come to expect from memory foam mattresses, and a 6" poly foam support layer provides strength and durability, whether sitting on the edge or lying down. B Corp Certified: Our social impact program is the heart and soul of Leesa. We donate one mattress for every ten we sell. Our commitment to use the power of business as a force for good is a crucial part of our success. Better Design: Redesigned from the inside out to give you the comfort, support, and universal feel everybody needs to sleep better. The classic iconic Leesa mattress feels as good as it looks. 100 Nights Risk Free: Because we know it takes more than one night to fall in love, you have 100 nights with Leesa to decide, or return it for a full refund. Free UPS Shipping: The Leesa mattress is 100% American made and, though it sounds crazy, it ships compressed in a box and it still feels great. All Leesa mattresses are built-to-order, compressed, boxed and shipped directly to your doorstep within days. They come with a 100-night risk-free trial, free shipping, no hassle returns and a 10-year warranty. 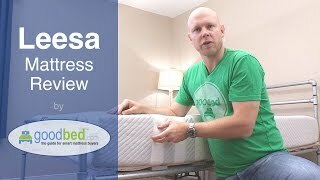 To decide whether Leesa is the right choice for you, read GoodBed's expert review of the Leesa mattress or watch our in-depth video review of the Leesa mattress. Is Leesa the right bed for you? Leesa mattresses are recommended by 59% of owners on GoodBed (based on 588 ratings + 2 reviews). Do you have something to say about your Leesa mattress? Write a Review! Note: The product line specifications above were derived from the active Leesa models listed on GoodBed. As a result, these details may not be comprehensive and may not apply to all Leesa models. If you are seeking specifications for a particular Leesa mattress, please search for that mattress by name on GoodBed, or check with your local Leesa dealer. Leesa is a mattress manufacturer founded in 2014 that is based in Virginia Beach, VA in the United States. Have an update or correction to our information about Leesa? If so, please take a moment to suggest an edit. Leesa mattresses sold by Leesa come with a 100-night in-home trial. Leesa mattresses are only available online.